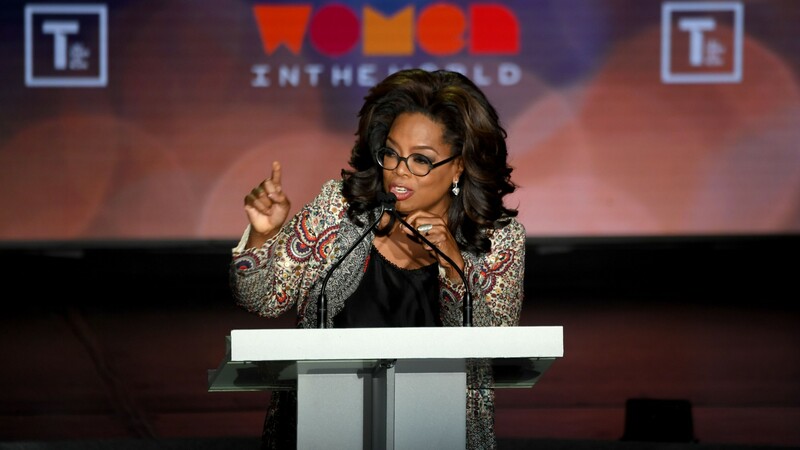 We can’t imagine a better way to kick off an important event like the 2019 Women in the World Summit than to make sure the patron saint of feeling empowered, Oprah Winfrey, is there to make it happen. On Wednesday evening, Winfrey delivered the keynote speech for the summit’s 10th anniversary in New York City. Winfrey’s message was (as per usual) uplifting and full of inspiring ideas about how women can be better feminists and activists in their own communities. Winfrey was joined by fellow celebs and activists like Brie Larson and Ashley Judd, but it was her keynote that already stands out as the highlight of the event. Per The Hollywood Reporter, Winfrey’s Women in the World Summit keynote took aim at the current political climate and, without naming President Donald Trump, offered a strong indictment of his past actions and their potentially negative effects on society. For Winfrey, the answer is easy to land on because of course, it’s “yes,” and she goes on to explain what women can do after rocking the boat and taking the first steps towards making a change. Winfrey went on to remark on the innate strength and resilience of women in the face of unimaginable hardship and how it is an advantage that the interests of women across the nation are represented in the 42 congresswomen who recently began their congressional terms.